HAILING FROM THE LAND DOWN UNDER, I Heart Hiroshima cannot help but be confident of a considerable UK following  because this three-piece band has already established a sizeable fan base back home. In 2006, a bunch of songs the band recorded with a student friend were swiftly picked up by Valve Records and released as I Heart Hiroshima's debut EP Three Letter Word For Candy  including London In Love, which subsequently appeared on Artrocker's Xmas 2007 Sampler CD. The band's second EP Cut In Colour, was recorded in a real studio with Magoo, before I Heart Hiroshima set off on their first national headline tour, followed by a debut performance on the Gold Coast Big Day Out at the close of 2006. In spring 2007 the band went into the studio in Sydney at Megaphon with Jonboyrock to record Tuff Teef before mastering it in New York with Alan Douches. 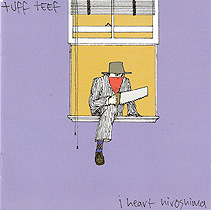 If I Heart Hiroshima's Tuff Teef album is anything to go by, we're in for an interesting time. We're told the band's "strangely irresistible, powerful yet delicate minimalist indie rock sound  courtesy of their 'bass-less' line-up of two guitars, drums and triple shared female/male vocals" is responsible for their success in Oz. The band's special ability to go to dark places musically while remaining warm and captivating just might have something to do with their boy-girl melodies and the interesting dynamism created when Matthew Somers' jagged delivery vies with Susie Patten's cute vocals. The well developed mix of Matthew on guitar/voice; Susie, drums/voice; and Cameron Hawes, guitar/voice gives I Heart Hiroshima a distinctive sound. The band was formed in July 2005 at a house party in Brisbane. As an alt-rock 'bass-less' trio, the three are influenced by a number of artistes, including Sleater Kinney, TV On The Radio, Leonard Cohen (who wouldn't be?! ), The Smiths, The Raveonettes, Magnetic Fields, Frank Black, Jesus and Mary Chain, The Walkmen, Slumber Party and The Pharcyde. Having impressed  and been invited to tour Australia with  Peaches, Ratatat and The Rogers Sisters, I Heart Hiroshima has now confirmed an October tour with Conor Oberst. The band's credibility goes on: I Heart Hiroshima has supported  and won praise from  Clap Your Hands Say Yeah, Erase Errata, Deerhoof, Cat Power, Stereo Total, Broken Social Scene and Tricky. Furthermore, Go-Between's Robert Forster recently invited I Heart Hiroshima's drummer Susie to play the drums with him on his Velvet Underground homage for the Andy Warhol exhibition at the Gallery of Modern Art in Brisbane, where the band is based. I Heart Hiroshima's debut album Tuff Teef received rave reviews in Australia and is currently enjoying extensive airplay on American college and Alternative Radio, having been voted Best Debut Album for 2007 by Brisbane's music scene. The band's refreshing take on what is now a very tried-and-true formula of tightly-wound indie pop ensures that I Heart Hiroshima oozes charm and attraction. It is this same charm and attraction that marks the Tuff Teef album. There is that brave and fantastic beginnings with Lungs  a great punk-rock overwash that can't wait to be noticed. Surgery is wonderfully whacky and Crime simply terrific to listen to. Feel the joy! One of the more unusual tracks is Crook'd with a great measure of creativity and Throw That Metal has a lot of appeal with its familiar rock undertone. Punks is to be released as a single and it is easy to see why: it is full of energetic punkography with a rock beat and important, heroic vocals that offer plenty of spotlight time for the instrumentals. Tuff Teef is an enjoyable, free-for-all indie-rock-punk album with strange words and determined instrumentals. At times melodic; other times rousingly rock but with a pulse of original punk.